The birth of a baby in the family is more than just a joyous occasion – it also calls for a lot of adjustments on the part of the family members. In today’s world, where most of us may not live in the spacious bungalows of yesteryears, it is advisable to start planning our child’s room well in advance. With a little thought and planning you can create a happy room for your child that will remain appealing to him as he grows. If you have an extra room to spare, earmark it for the child. It can be decorated as a Nursery while he is a baby, the décor and furniture can be changed as he grows. It’s great fun for new parents to do up the Nursery- many prefer to have a blue color for boys and a pink one for girls. Keep the baby’s cradle, soft toys etc in the room and have a divan for an adult to sleep if necessary. Put a colorful rug on the floor for the baby to play on. Paint the walls in bright colors and put up cute posters on the walls. As the baby grows into a toddler, have a proper bed made for him. If you have more than one child, bunk beds are a good idea and the kids are sure to love them. You can also carve out individual sanctuaries out of a shared room with the help of a room divider, a curtain or even a piece of furniture. Keep a big wooden box in a corner in which he can keep his toys. Have low shelves around, where he can display some soft toys, dolls, cars etc. Buy colorful bed-sheets, bedspreads and pillow covers (with cartoon figures, balloons etc on them) which are appropriate for a child’s room. You can use lively striped fabric in a toddler’s room. Choose a bright unexpected color (peach or sunflower yellow for example) and pair with always-cheerful polka dots for long term style. Install an almirah for the child and arrange his clothes there. As the child grows older, he can be taught to fold the clothes and put them back on the shelves, or to hang them. Encourage him to take care of his belongings – shoes, clothes, toys, books – and point out appropriate places for each. As the child starts to go to Nursery and then to school, put up a study table and chair in a corner of his room. Ensure that the area is well-lit. Install a book-case and buy a colorful pencil holder and other accessories for his table. Encourage him to do his homework, drawing or painting at his desk. 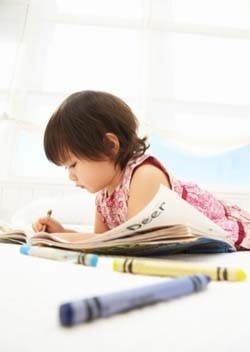 Buy him some picture books and later, some simple story books to instill the habit of reading. You can re-decorate your child’s room every 2-3 years with a minimum of fuss and expense. Plan ahead and choose furniture that has a life beyond babyhood. Multi-purpose furniture is readily available today. Many cribs can easily convert into junior beds, small sofas, settees and later twin-size beds, often with addition or extension of side rail kits. Keep the design and décor of the room flexible enough to accommodate your child’s changing tastes, needs and desires. You can put up a soft board on the wall where he can pin up his school time -table, pictures as well as any reminders. Plan a colorful floor seating arrangement for his friends when they come to play. Make more space for his toys, jigsaw puzzles and board games and encourage him to keep his things neatly. Gift him an unusual shaped alarm clock and encourage him to use it to wake up in time for school. The best children's’ rooms are so much more than just a place to sleep- they provide a comfortable space for play and study, offer privacy when it is needed and encourage creativity or just quiet contemplation. A child’s room should also express the personality of the occupant(s) in a way that celebrate their unique interests and talents. You can change the décor of the room with minimum fuss. Painting the walls a different shade, putting up posters and collages on the walls, installing a comfortable arm-chair for light reading and adding knick knacks and framed photographs will all add to the décor. Children love bright colors. You can paint one wall in, say, bright red, but the other walls can be painted in softer shades so that the colors don’t jar the senses. As the child goes into pre-teens and teens, he may need a computer, a music system and a separate TV. You can put up a computer corner and extend the wooden plank to hold the TV and music system. Get colorful dust covers for all the electronic equipment and tell him to cover them when not in use. A teenager may have other hobbies like playing the guitar, cricket, chess, embroidery, painting etc. Stuff relating to his hobbies can also be arranged in his room which is now a “teen retreat”. Many space-saving furniture and items are available in the market like a cassette/CD rack nailed to the wall, a perpendicular multi-rack bookcase, folding tables and so on, which you can get for his room. Give the children’s room a neat look so that it doesn’t look cluttered and over-crowded. Maximize storage space to minimize clutter and mess. Organize space to store books, toys, puzzles and games. Don’t be too rigid on color schemes. If the room has an attached bath, let him arrange his toiletries in the bathroom cupboard or on the shelf. Give him some colorful towels to use. A teenage girl would love to have her own dressing table. In case of space constraints, fix a full-length mirror on the wall, and install a shelf with drawers for her cosmetics and junk jewellery. Reena, a friend of mine, keeps colorful dusters in her kid’s room and encourages them to do their own dusting. The kids take turns and do it quite happily. They are proud of their colorful and tidy room. Punam, a cousin, has installed a ‘snack corner’ in her kid’s room. She has bought a set of colorful jars and keeps biscuits, cookies, popcorn, chips etc for her kids to munch upon. She also keeps a bowl of fruit and a jug of water there. “That way they don’t raid my kitchen when they are hungry and mess it up”, she says. When the teenaged kids study late into the night for their exams, Punam keeps a flask of coffee and a box of sandwiches for them. In summer she keeps a jug of fresh fruit juice and an icebox. It’s a good idea to have a covered shoe-rack in the child’s room. Keep shoe polish, brush, cloth etc handy, so that he can clean his shoes when required. My daughter Neha carefully packs away her shoes/sandals in separate polythene bags after use. The furniture in your child’s room should be lightweight so that you can move it around to give the room a different look. Rahul, a friend’s son, hangs his guitar at an angle on the wall in his room and has placed his music system and CDs on a low stool just below it. Next to it he has placed a floor cushion and calls it his ‘music corner’. The top of a large wooden box for toys can double up as a table. Keep window decoration simple. The decorative fabric used for curtains can be repeated in other items – pillow covers, quilts, lampshades, bedding etc. Cover one wall with a large world map – it’s a great way to improve your child’s knowledge of geography. Use wallpaper or paint to add color or texture. Paint should have a semi-gloss finish. You can paint clouds or stars on the ceiling for an unusual look. Put a pretty table lamp on the child’s desk to create the right study atmosphere. Choose the right lighting – there should be a functional light (for studying) and a soothing one (for listening to music, watching TV etc). Install a night light if needed. Keep all the child’s stationery (pens, pencils, erasers, scale, geometry box, pins, stapler, paints etc) close at hand, so that he doesn’t have to get up from his study table often. If the child is good at handicrafts/painting/embroidery, display his/her handmade items in the room. Talk to your child before re-decorating his room. Get his opinion on the color scheme, theme etc. Allow him to help you in decorating the room and take him along to buy furnishings, linen, wallpaper, paint etc. Keep a colorful dustbin in one corner and tell him not to litter the room. Make storage a priority. Reduce clutter by having more shelves, large wicker or plastic baskets, lot of racks etc. Make the child’s room multi-functional – have separate areas for playing, studying, light reading and a display area as well. Allow your child to select the decoration theme from a wide range like dinosaurs, starry night, castles, outer space, racing cars, trains, jungle motifs, cartoon characters, fairy tales, wizards, dragons, butterfly, princess, cricket etc. Respect the child’s privacy. Knock on the door before entering. Don’t keep on popping in to see if he is studying. Thus, a little bit of thought, planning, patience and imagination will go a long way in doing up your child’s room well. Make the room ‘grow’ along with him and ensure that it is a place where he is comfortable, safe and happy.